The park has tremendous diversity in topography and vegetation. The rounded hilltops of the Quesnel Highlands on the west side of the circuit have a unique character quite different from the imposing Cariboo Mountains on the eastern and southern sections of the circuit. The park is a place of many moods, from bright sunshine and placid blue lakes to angry gray waters and torrential rains. Bowron Lake Park also has a very pleasant 25 unit drive-in campground. The campground is located near the Registration Centre a short distance from Bowron Lake itself. There are also a few short walking trails nearby. Increased park visitation during recent years has placed a great deal of pressure on the park’s resources. If we are to preserve the wilderness experience, it is up to each visitor to treat this special area with the respect it deserves. Get information on the nearby community of Wells and local services. Please read the Pre-trip Information Booklet [PDF 1.43MB] before reserving or visiting the park. Please view the short orientation video to help plan your trip to the Bowron Lake Canoe Circuit. Bowron Lake Park’s rules and regulations have been put in place to ensure the comfort and safety of park visitors and to reduce impacts on the park facilities and natural values from visitor use. The regulations are not optional and will be enforced. Canoes and kayaks are allowed on the circuit. Motorized boats are not permitted. Maximum axle width of canoe carts is 75 cm (30 inches). Wide track tires are recommended. If using a cart, the weight of cargo in canoe must not exceed 28 kg (60 lbs.) You must backpack all gear in excess of the 28 kg limit. In order to protect the quality of wilderness experience and reduce impacts on the park, group parties and individuals are managed separately and the number of daily departures onto the canoe circuit is limited. The number of people permitted to camp together in group sites is a maximum of 14 people. Groups are required to camp at predetermined group campsites which will be allocated when the group arrives at the park. Anyone in excess of this allowable limit will be required to camp in available individual campsites separate from the group sites. Individual parties are not permitted to camp in group campsites and must use sites designated for individual party use. These regulations are enforced to ensure that all park visitors may experience the use and enjoyment of Bowron Lake Park. Both black and grizzly bears are found in Bowron Lake Provincial Park. Bear-proof caches are provided at designated campsites and must be used at all times. Read the Bear Safety Information. Portable stereos with external speakers are prohibited on the Bowron Lake canoe circuit. Any person acting as a guide or offering guiding services in Bowron Lake Park must hold a valid Park Use Permit (Park, Conservancy and Recreation Area Regulation, Section 4). Repeated violations or serious infractions may result in charges under the Park Act and/or eviction from the park. With up to 4,500 people travelling the canoe circuit each season, impacts on the park are considerable. Although you may not immediately see the effects of your actions, please keep in mind the cumulative effect of all the people who will visit the park this year. The Bowron Lake Canoe Circuit is a wilderness area. Anyone planning to paddle the circuit should come to the park well prepared and with some canoeing experience. Read more about being prepared. Bowron Lake is a multi-use recreational lake used by both motorized and non-motorized watercraft read and understand the Boating Code of Ethics for Bowron Lake [PDF]. There are no cellular phone capabilities on the circuit. Six public two-way radios have been placed around the circuit for use in the event of an emergency only (see map area). These radios are not for personal calls or requests for forgotten or broken equipment. Abuse of this equipment will result in prosecution. Visitors may bring their own registered communication system, but are not permitted to access the radio frequencies used by BC Parks. Starting on October 1st of 2016, park visitors will be able to reserve their trips for the entire 2017 season at for the Bowron Lake Canoe Circuit in Bowron Lake Provincial Park (and the Berg Lake Trail in Mount Robson Provincial Park). This change will allow international and domestic travelers more time to plan and commit to these world class wilderness experiences. Reservations for the 2016 season are currently being accepted: www.discovercamping.ca. All reservable, vehicle accessible campsites and the backcountry canoe circuit must be reserved through Discover Camping. Read about making reservations here. When reservations are not available all campsites function as first-come, first-served. Reservations for the Bowron Lake Canoe Circuit are accepted at this park. Click the link, below and in step 1. please select “Backcountry Bowron Lake” under Reservation Type. Overnight parking for registered circuit travellers is provided near the Registration Centre free of charge. Bowron Lake Park is located about 120 kilometres east of Quesnel. Drive north on Highway 97 through Quesnel, then follow signs onto Highway 26, which leads through Wells. Approximately 1km before the historic townsite of Barkerville, turn left onto the Bowron Lake Road. From there it’s another 27 km to the park entrance on a wide, well-graded dirt road where a 25 unit frontcountry campground and the 116 km wilderness canoe circuit are located. National Topographic Series 1:50,000 maps of the park are available at most BC map retailers. While they may be of interest, they are not necessary for people attempting the Canoe Circuit, as the park map and brochure are sufficient for navigation. Relevant maps are 93H2, 93H3, and 93H6. Google Earth KML file of the campsites [KML] Must have Google Earth and/or and Google Maps installed. Google Earth KML file of the location of all the emergency radios [KML] Must have Google Earth and/or and Google Maps installed. Plate 1 [PDF] – The dramatic landscape around Mitchell Lake in Cariboo Mountains Park. Plate 2 [PDF] – Avalanche tracks at the headwaters of the Mitchell River in Cariboo Mountains Park. Plate 3 [PDF] – Looking south down Niagara Creek in Cariboo Mountains Park. Plate 4 [PDF] – Looking east into the Betty Wendle addition to Bowron Lake Park. Plate 5 [PDF] – Looking northeast in the Cariboo River addition to Bowron Lake Park. Plate 6 [PDF] – Looking northeast in the Wolverine addition to Bowron Lake Park. Plate 8 [PDF] – Looking south down Cariboo River Park. Plate 9 [PDF] – Typical backcountry in Cariboo Mountains Park. Plate 10 [PDF] – Canoeist preparing to enter Kibbee Lake. Photo courtesy of Peter Tasker. Plate 11 [PDF] – Looking east up the headwaters of Bowron Lake Park. Plate 12 [PDF] – Looking east into Upper Niagara Creek in Cariboo Mountains Park. Plate 13 [PDF] – The Mitchell River wetlands. Plate 14 [PDF] – Looking west down Ghost Lake in the Natural Environment Zone. Plate 15 [PDF] – The Bowron Lake campground in 1973. Photo courtesy of Peter Tasker. Plate 16 [PDF] – Looking east down Mitchell Lake. Mitchell River in foreground. Plate 17 [PDF] – Looking west over Summit and Stranger Lakes at Quesnel Lake in background. Plate 18 [PDF] – Cow moose feeding in the Bowron wetlands. Plate 19 [PDF] – The Bowron Lake wetlands. Plate 20 [PDF] – Looking northeast across Isaac Lake up the Wolverine Creek. Anonymous. Plate 21 [PDF] – Twin Lakes in the alpine of Cariboo Mountains Park and Wells Gray Park. Plate 22 [PDF] – One of the old trapper cabins located around the Bowron canoe circuit at McLeary Lake. Photo courtesy of Leif Grandell. Plate 23 [PDF] – Trails on the Bowron Circuit have been vastly improved from the knee high mud that existed in 1973. Photo courtesy of Peter Tasker. Plate 24 [PDF] – The west side of the Bowron Lake canoe circuit. Photo courtesy of Don Olesiuk. Plate 25 [PDF] – A side valley draining into the Matthew River Valley from Cariboo Mountains Park. 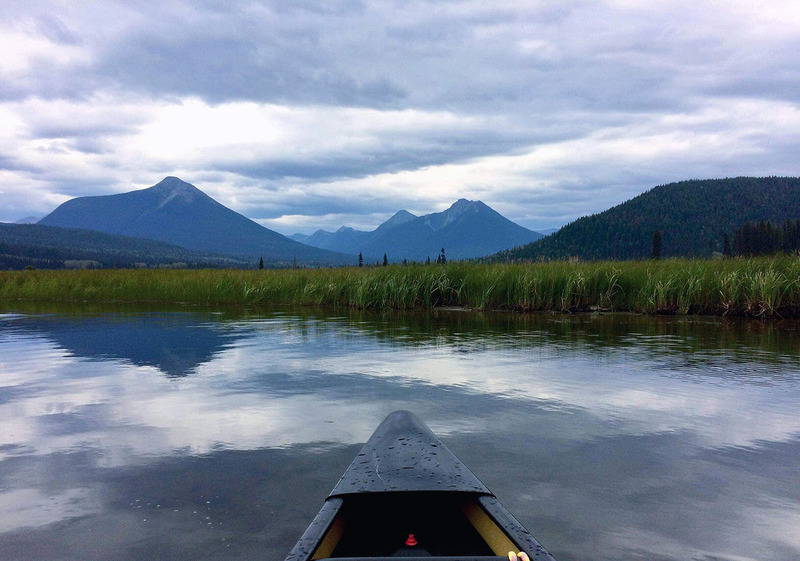 Canoeing and kayaking are by far the most popular activities in Bowron Lake Park. The Canoe Circuit is renowned world-wide, attracting many visitors from Europe, the United States and across Canada. Canoes and kayaks are allowed on the circuit. Motorized boats are not permitted. Canoes, kayaks, wall tents and canoe carts are available for rent during the summer months through local outfitters as well as at the park through the Park Operator. Reserving a departure time for the Canoe Circuit is highly recommended since the number of canoes per day is restricted. Please read the reservations information on this page. The sport fish in the lakes and rivers on the circuit are bull trout, kokanee, rainbow trout and lake trout. Bring a variety of flies and lures. June and September have proven to be the best months for fishing. People can ice fish on Bowron Lake during the winter. Local lodges and stores at Bowron sell licences. Anyone fishing or angling in British Columbia must have an appropriate licence. Portage trails link all the lakes and waterways of the Circuit, and provide safe routes around rapids and waterfalls. There are 10.8 km of portages in total. All the portages are built to a high standard and are smooth enough for canoe carts, provided weight and width limits are complied with (see additional information section below). During the rainy season, portage trails may become rugged and muddy, making passage challenging in places. Other than portages, there are only two developed trails in the park, which are all accessed from the Canoe Circuit. These are short trails to viewpoints of Cariboo River Falls and Hunter Lake. Refer to the map in the brochure for exact distance and location of trails. Dogs and other domestic animals are not permitted on the Canoe Circuit. Backcountry areas are not suitable for dogs due to wildlife issues and the potential for problems with bears. Only in the vehicle accessible campground are pets permitted, but they must be on a leash at all times and are not allowed in park buildings. You are responsible for their behaviour and must dispose of their excrement. There are beautiful sandy beaches on many of the lakes on the circuit. Swimming is a great way to ease tired paddling muscles. Although all the lakes are warm enough for bathing in the summer, you will find the lakes on the West Side warmer. These lakes are stream-fed, whereas the glaciers and snowfields of the Cariboo Mountains feed the east side lakes. Please do not use soap (even biodegradable) for washing in the lakes. If you must wash with soap, do it at least 50 m (150 ft) inland from the lakeshore, and then deposit soapy water in the outhouse. The canoe portage trails can be used as crosscountry ski trails; however, there are no set tracks. A gravel single-wide boat launch is located at the north end of Bowron Lake near the private lodges. Power boats are only permitted on Bowron Lake and are not allowed on the Bowron slough or other lakes in the park. However, Park Rangers do use power boats to travel throughout the canoe circuit. There is a canoe landing dock at the main campground. There are 6 cabins located throughout the circuit, that hold from 4 to 6 people. They are available throughout the summer and winter, there is no charge to stay in them and they must be shared. The cabins are for emergency use only and for drying out of equipment. They are not intended for camping. Refer to the map in the brochure for locations of the cabins. There are no lodges in the park for public use; however, there are two located near the park boundary on Bowron Lake. Campfires are permitted. Paddlers of the Circuit must bring a portable stove for cooking. Some firewood is available at woodlots located around the Circuit; the Park Operator will inform paddlers of woodlot locations upon registration. Cold water taps are located throughout the drive-in campground. Taps are shut off during the off-season. Out on the Canoe Circuit, you must use a reliable method of water purification, as no potable water is provided. Either boil drinking water for at least two minutes or use a commercial water filter effective against Giardia (beaver fever). Group camping along the backcountry canoe circuit is available at this park. Only one group departure consisting of 7 to 14 people is permitted each day. Groups must follow a fixed itinerary as per Bowron Lake Group policies. Reservations are mandatory for groups. Get more information about reserving. This park has only pit toilets – no flush toilets. This park offers vehicle accessible campsites at the Bowron Lake Campground on a first-come, first-served basis – campsite reservations are also accepted. There are 25 sites at the campground consisting of 3 doubles sites and the rest being single sites of medium size. The sites are shaded and parking is available for extra vehicles. The closest store is Bear River Mercantile, located about 1 km away towards Bowron Lake. There is no payphone in the park. If staff are not available when you arrive at the campground, choose your site and pay later. Staff will be at the campground at least once a day during the camping season. Wilderness camping is allowed at camping areas spaced out around the Circuit. The size of the sites varies from two to eight tent pads. All sites provide bear food caches, outhouses and fire rings. Some feature picnic shelters or rustic cabins. Refer to the map in the brochure for exact locations. Get more information.